New supply chain data shows the impact of a $9 billion OLED screen contract on Samsung, which could see as many as 55 million "iPhone 8" flagship phones shipping to consumers by the end of this year. The report from South Korea-based ET News suggests that a ASA LCD screen factory needs to be converted into an OLED plant solely as a result of the massive demand putting pressure on the existing facilities. As a result, Samsung is forced to dole out $8.8 billion just in 2017 to improve production capacity. Should the report be accurate, the capital expenditure needed to fulfill the contract is nearly all the money it is making from Apple on the deal. The same report suggests that out of the 100 million "iPhone 7s," "iPhone 7s Plus," and "iPhone 8" units expected to be delivered by the end of calendar year 2017, 55 million are expected to be the high-end "iPhone 8" loaded with new technologies. On Monday, reports started circulating about the ramped-up OLED contract between Apple and Samsung. The contact, confirmed by multiple sources inside the supply chain, is said to be an escalation of the $4.3 billion one signed in February for 60 million panels. IHS Markit analyst David Hsieh added that Samsung could deliver as many as 95 million panels if Apple needs them. 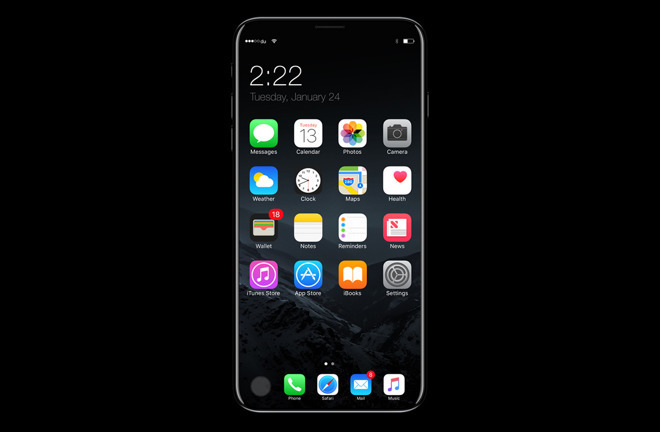 Apple's "iPhone 8" is expected to be revealed alongside the "iPhone 7s" family in the fall of 2017, and use a 5.8-inch edge-to-edge OLED panel with a 5.1-inch practical area, the rest being dedicated to virtual buttons. Other features rumored to be included in the device are a 3D facial scanner, and other sensors embedded in the front glass of the device. Suppliers for components in the "iPhone 8" named in a report on Wednesday are TSMC, Foxconn Electronics, Pegatron Technology, Wistron, Advanced Semiconductor Engineering (ASE), Largan Precision, Cyntec and Yageo. Himax was recently reported to be the source of components for the 3D sensor cited as a reason for possible delays in the device.